Oh I do love Wemyss. The single cask bottlings they’ve put together lately have been very impressive on the whole, as well as being really well priced. I’ve seen them at a few whisky events now, and you can find them on a lot of the usual whisky websites. Oh, and their nosing panel’s chaired by Charlie Maclean. You know, the chap in the kilt who’s in The Angels’ Share. 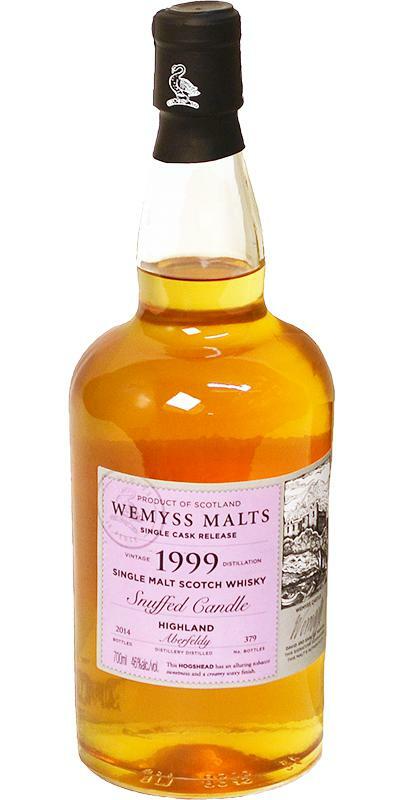 He decides what the title on the bottle’s going to be, so all the Wemyss single cask releases have names like “Rockpool”, “Peaches and Cream”, “Dark Treacle Fondant”. This here be an Aberfeldy, and it’s titled “Snuffed Candle”. One of the Dewars’ distilleries, you’re starting to see more and more whisky from this one appearing on the market rather than going into blended malt, which is always good to see. Nose: Sherbet candy, lavender, french fondant fancy, green apple skin. Palate: Brittle candy, vanilla, orange peel, lemon juice, black pepper and gentle, tangy peat smoke. Finish: Tingly with a touch of oak. Not sure about snuffed candle. I get a nice smoky tingle on the palate but not much soot or sulphur. For me this is mostly about sweetshop candy notes, and very pleasant they are too. If lightly peated, candylicious Highland malt is your thing then this’ll pique your interest big time.